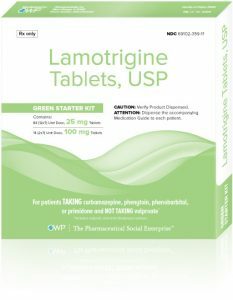 Why Start With OWP Lamotrigine Starter Kits? 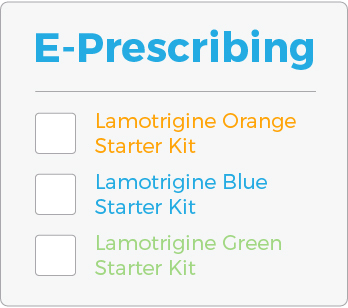 Your EHR may allow you to attach the OWP Lamotrigine Starter Kit co-pay card and send it with the e-prescription directly to the pharmacy. 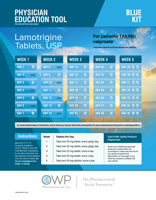 Instruct your patient to contact OWP Pharmaceuticals at 1-800-273-6729 if they have difficulty filling their prescription at their local pharmacy or if they have any questions regarding their OWP Lamotrigine Starter Kit prescription. 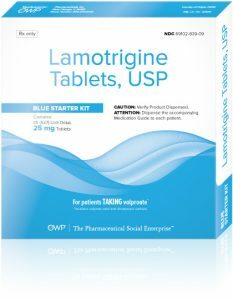 Pharmacist Information – OWP Lamotrigine Starter Kits are available through the wholesalers Amerisource, Cardinal, McKesson, HD Smith, and others. 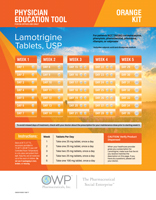 If you have any questions, please contact OWP Pharmaceuticals at 1-800-273-6729. 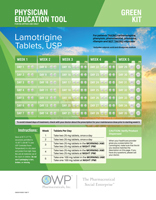 Safety and efficacy of Lamotrigine used as adjunctive treatment for partial-onset seizures in very young pediatric patients (aged 1 to 24 months) has not been demonstrated. 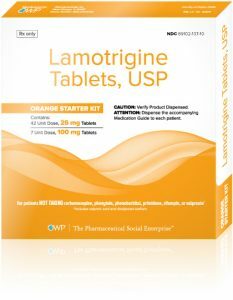 Please refer to the full Prescribing Information for Lamotrigine Tablets, including Medication Guide at www.owppharma.com/starter-kit. © 2019 OWP Pharmaceuticals, Inc. All Rights Reserved. The OWP Pharmaceuticals logo, ROW Foundation logo, WorldPrint iconography, Heart Venn Diagram image, phrase “One World. One Standard.”, phrase “The Pharmaceutical Social Enterprise”, and phrase “Epilepsy is a global problem that deserves a global solution.” are all registered service marks of OWP Pharmaceuticals, Inc.
You are about to enter a site that is for US Healthcare Professionals only. By selecting "YES" below, you certify that you are a healthcare professional and that you wish to proceed to the Healthcare Professionals Only section of this site. Products or treatments described on this site are available in the US but may not be available in all other countries.